Are the presidential candidates wrong on jobs? One of Ashley Brinkman's all-time favorite emails arrived in January: it said she was getting an $11,000 raise. For Brinkman, it was a miracle. A timely one, at that. The 28-year-old recently bought a home with her husband in Anchorage, Alaska. The purchase was a "real stretch" financially. The substantial jump in pay this year -- about 15% -- changed the couple's budget. They're even talking about a summer vacation. 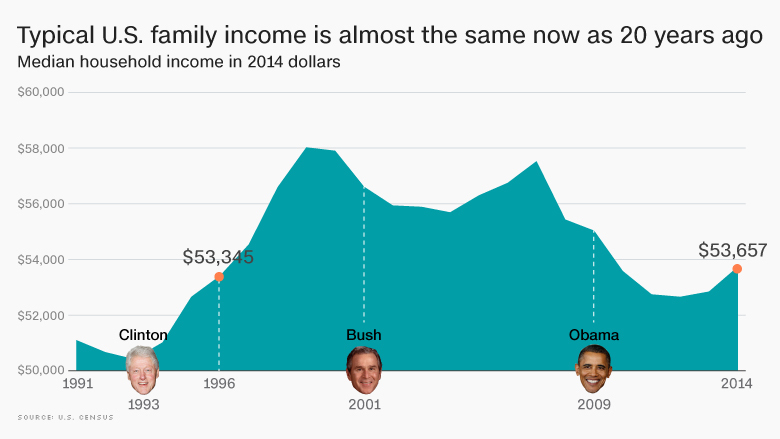 "We are living the middle class dream," Brinkman told CNNMoney. Ashley Brinkman of Anchorage, Alaska and her husband. Brinkman's been a loyal employee to her financial firm. She was hired as a bank teller in the dark days of 2008. She says she "put her nose down" and worked her way up to become a marketing and communications manager. In July, the company gave out merit pay increases. Then in the winter, her company's human resources department conducted a "salary survey" to crosscheck if its wages were competitive. That's when HR found that Brinkman was underpaid. Worried that a rival would recruit her away, the company bumped up her salary. The pay jump is a good sign for Brinkman -- and all U.S. workers. Wage increases tend to be a chain reaction. One company follows another. Full-time employees under 35 averaged nearly 7% pay raises in 2015. Workers under 25 had an almost 9% rise. "Wage growth appears to be more robust than generally reported," says Ahu Yildrimaz, head of the ADP Research Institute. She believes conditions are in place for more workers to get raises soon. 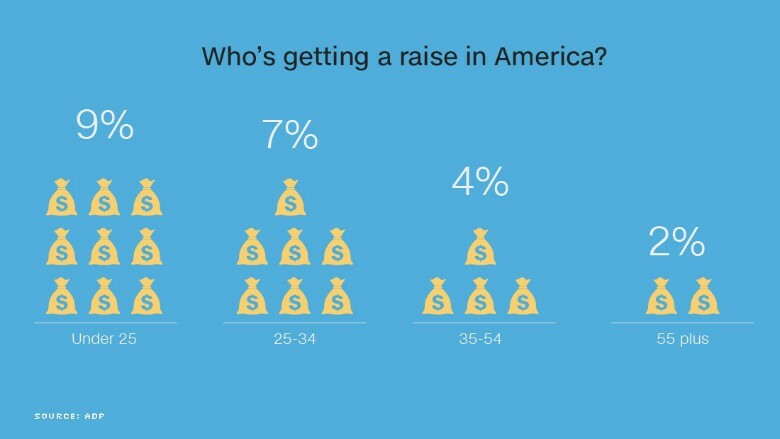 CNN wants to know: Are you getting a raise? 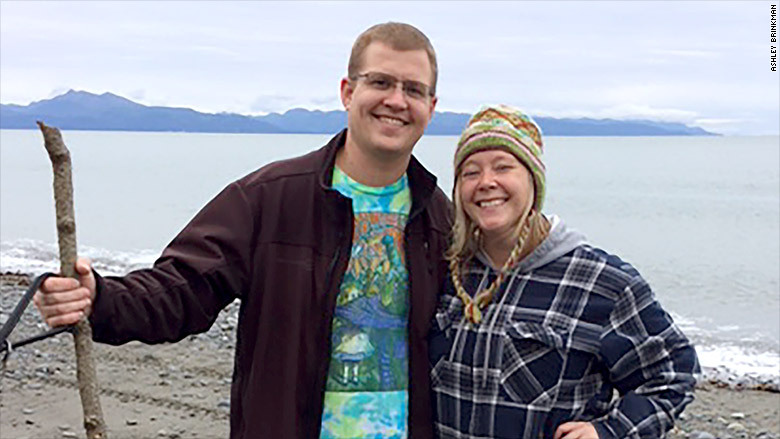 CNNMoney readers from Poughkeepsie, N.Y., to Key Largo, Florida to Anchorage, Alaska are reporting that they are getting raises of 3%, 5% or even 25%. 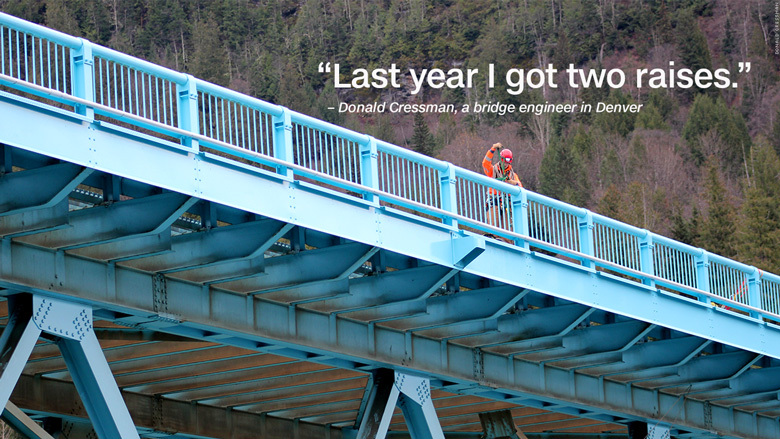 Bridge inspection engineer Donald Cressman is one of the fortunate ones. "I've only been in the job market for three and a half years. Each year, I've gotten a pretty decent raise," says Cressman, a 26-year-old living in Denver, Colorado. Life is good for high-skilled workers like Cressman in booming job markets. Last year he received two raises to keep his pay competitive. "There are a lot of young engineers graduating college now. This is the perfect job. It pays well," says Cressman. The best way to boost your pay dramatically is to change jobs. People who switch to another company see the biggest raises, according to ADP and government data. It makes sense: workers typically tell their new company they won't come unless they get paid a lot more. These jumps in pay aren't reflected in the broadest data that analyze the entire U.S. workforce. Official government statistics from the Labor Department show anemic wage growth. Before the Great Recession, wages were growing 3.5 to 4% a year. Lately, U.S. workers have been lucky to get 2% bumps. That doesn't go far when health care and education expenses, among others, are skyrocketing. "I'm somewhat surprised we are not seeing more of a pickup in wage growth," Janet Yellen, America's top economic policymaker, said last week. It's one of the top reasons American voters are so angry. They list the economy as their top concern. Americans have been waiting a long time for raises. The typical U.S. family earns about the same amount now as 20 years ago, once you adjust for inflation (in other words, it takes into account that many things cost more now and $1 doesn't go as far as it once did). It's one of the big flaws of the "Obama economy." Millions of people have gone back to work and unemployment has fallen to just 4.9%. Economic textbooks say once this happens, wages should go up. Yet for every Brinkman and Cressman who are getting pay bumps, there are many whose lives were derailed by the Great Recession and are now stuck in dead-end jobs. They don't need just one pay increase, they see themselves as years behind. Economists -- and presidential candidates -- are watching wages closely. There are encouraging signs of a pickup, but many are still waiting for their own salary "good news" emails. --CNNMoney's Patrick Gillespie contributed to this article.